From 65 to 98 € the night I book ! 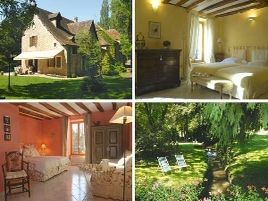 In the very heart of Burgundy, near the vineyards of Chalon-sur-Saone and the prestigious towns of Beaune and Cluny, a peaceful watermill set in lovely leafy grounds, through which runs the mill brook. The four elegant guest rooms are located in the beautifully converted millhouse. Breakfast and dinner are served in the lounge with its open fire, or on the terrace in fine weather. Warm welcome with a personal touch..
- golf de Chalon-sur-Saône à 15 km. - Voie Verte à 4 km. 4 rooms with shower and private WC. TV on request. From 73 to 79 euros (2 pers. ), 89 euros (3 pers.). Extra bed 20 euros. A6 sortie Chalon-Sud, dir. Montceau-Le Creusot, RN 80 puis sortie 3 Saint-Désert. Dans Saint-Désert dir. stade et longer RN 80. The closest station is Chalon-sur-Saône, located at 15 km. The closest airport is Dijon, to 80 km.